In the Middle a Nitro Toyota 8" (TV6) pinion with 29 splines. OEM correct for 2003 & newer Toyota applications. 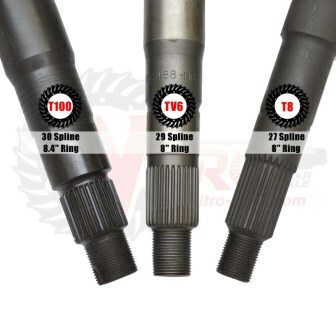 With a Nitro YOKTOYFITKIT-29 you can now upgrade early Toyota models to the superior 29 spline pinion and Nitro will never make you downgrade a late model Toyota to a 27 spline pinion like our competitors! For comparison on the right a Nitro Toyota 8.4" pinion. Close up of the pinion splines. Bridged bearing caps in the Toyota 8.4" housing. Size difference between 8" and Land Cruiser 9.5"